I wanted to draw your attention to our blog-friend and sometime contributor Tim Furnish‘s post, which offers a lucid introduction to the Trump administration’s National CT Strategy paper, situating it in contrast to the Obama admin’s version, and linking it to a very helpful breakdown of what we might call (remembering William James, but in mostly lower case) the varieties of Islamic experience. 1) Tim Furnish has a way superior understanding of the said varieties than John Bolton ever will have — plus he has a taste for pop culture asides! 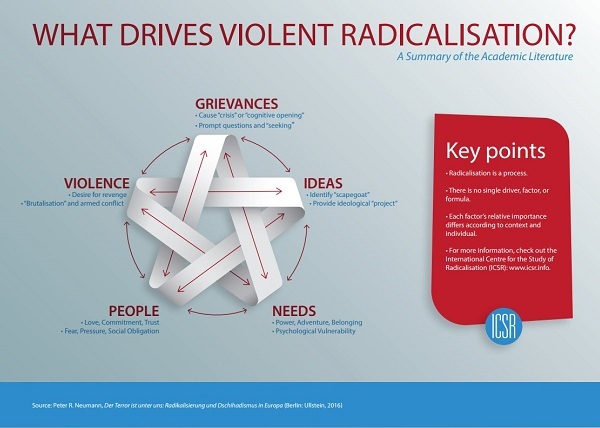 2) that the key issue to be further explored could be expressed in terms of the overlaps, Venn diagram-wise, between “literalist”, “mainstream” and “authentic” Islams. That’s a project I’ve been circling for more than a decade, and the closer I get, the more subtleties arise to be considered. Still circling in..
Thomas Hegghammer, JM Berger, Leah Farrall, Adam Elkus, Will McCants and John Horgan are others whose varied voices and opinions regaarding the new CT Strategy text I’ll be watching for. Tim’s essay and associated matters: Warmly recommended. Zen — pray chime in. I seem to remember that my grandmother’s house and garden was named Tanglewood — and certainly, the palace and gardens of Louis XVI are known simply as Versailles! French ornamental gardens represent one way to go about life, and English wild ramblings quite another — personally, I prefer the English way. People, after all, have grievances, ideas, and needs, and are the ones who resort to violence — and indeed, grievances are ideas, and sometimes born of needs. I could go on — but a five-pointed star with kinetic arrows folded into a graphically beautiful sort of Moebius arrangement is elegant and perhaps overly simple? The disappoint stems from the desire to attribute the jihadist phenomenon to a single cause rather than to several causes that work in tandem to produce it. To my mind, the most salient are these: a religious heritage that lauds fighting abroad to establish states and to protect one’s fellow Muslims; ultraconservative religious ideas and networks exploited by militant recruiters; peer pressure (if you know someone involved, you’re more likely to get involved); fear of religious persecution; poor governance (not type of government); youth unemployment or underemployment in large cities; and civil war. All of these factors are more at play in the Arab world now than at any other time in recent memory, which is fueling a jihadist resurgence around the world. If anyone elevates one of those factors above the others to diagnose the problem, you can be certain the resulting prescription will not work. It may even backfire, leading to more jihadist recruitment, not less. That’s more to my taste. Strapped to a gurney and visibly shaken by the bloodied bodies of his fellow terrorists strewn about, Mohammed Jamal Amir Kasab, aged twenty-one, begged his police interrogators to turn off their cameras. They refused, and Kasab’s recorded confession provided the world with a glimpse into the individual motivations of the young men behind the four days of attacks in Mumbai, India. Kasab explained that he “joined the militant group Lashkar-e-Taiba only for money.”1 His was not solely an individual decision, however, and the money he earned from participating in the attacks was not intended to be discretionary income. According to Kasab, his father had urged him to join so that Kasab and his siblings could afford to marry.2 Kasab recounted that his father had told him that his participation would mean that the family would no longer be poor and that they would be able to pay the costs required to finalize a marriage contract. 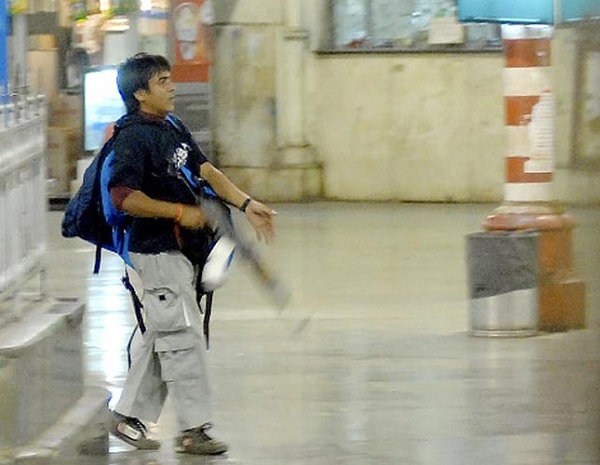 One of the police officers, seemingly ignoring Kasab’s response, pressed, “So you came here for jihad? Is that right?” Crying, Kasab asked, “What jihad?” Lashkar-e-Taiba deposited the promised money in his father’s account after the successful attack; for his participation, Kasab was hanged in 2012 by the Indian government. Whether his siblings were subsequently able to contract marriages as a result of the funds provided by Lashkar-e-Taiba remains unknown. The paper, by Valerie M. Hudson and Hilary Matfess, is published by MIT Press in International Security, Volume 42 Issue 1, Summer 2017, p.7-40 under the title, In Plain Sight: The Neglected Linkage between Brideprice and Violent Conflict. How little we know, how little we suspect, how diverse the world is, how varied the motives at play, even in matters that we study and feel we’ve grasped. Isis destroyed one of the greatest mosques in Islam on the night the Quran was revealed to the Prophet Mohammad. Will McCants comes closest to my own sense of the business with his invocation of symbolism and his words “self-inflicted decline” — this is an ouroboric moment, the (yes, self-inflicted) death of the birthplace of ISIS, a homecoming with a vengeance. 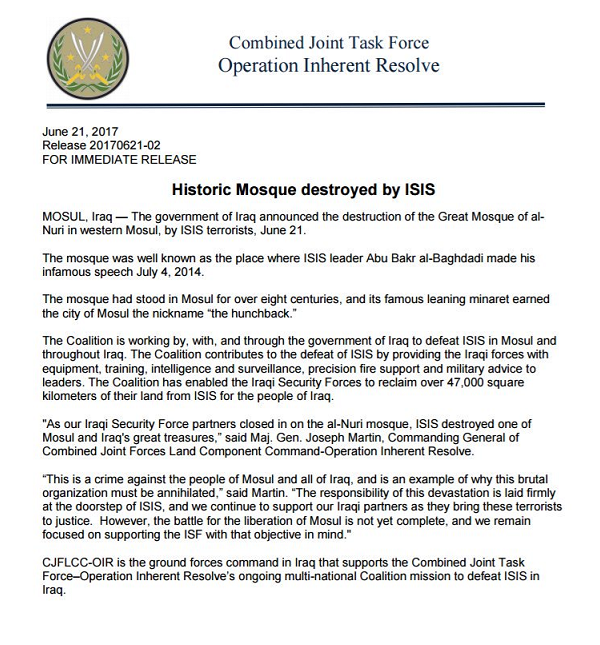 New York Times reporter Rukmini Callimachi notes ISIS has not shied away from using mosques for battle purposes, and suggests its destruction could be aimed at preventing coalition forces from taking control of it themselves — a move that could be of symbolic importance given the landmark’s role in the self-proclaimed caliphate’s founding. And there we go again — “the self-proclaimed caliphate” — ouroboric from start to finish. All this takes place on, of all nights, the Night of Power! Once again, I am amazed at the sheer Christianity to be found in Coptic responses to utterly horrific persecution. It was Bishop Angaelos, general bishop of the Orthodox Church in the United Kingdom, who delivered the remarkable sermon on forgiveness that I posted in my earlier report from the Forgiveness Chronicles..
As a Christian I could never justify a policy which only supported ‘our own’. The distinction should be based on people’s need, not their religion. I have long been prepping a book about religious violence, and in particular the way in which it can be triggered and viewed as sanctioned by the words of scriptures which elsewhere encourage peace, to be titled Landmines in the Garden — the garden being Pardes, Paradise..
Now that the specifically eschatological element of ISIS has been laid out in detail by WIll McCants in his brilliant The ISIS Apocalypse, however, I have felt a shift in emphasis, and the book as I now perceive it will view religious violence — and indeed other violence such as that which drove Dylann Roof to his Charleston killings — through th specific lense of forgiveness and love, as exemplified by Bishop Angaelos, and for the matter, the members of the Charleston congregation who testified to their forgiveness of Roof at his trial.